Order - Stop your Dabo Girl to name a number. 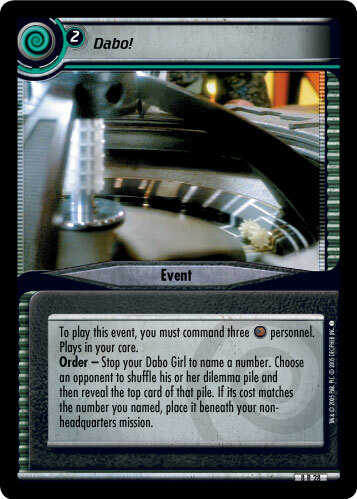 Choose an opponent to shuffle his or her dilemma pile and then reveal the top card of that pile. If its cost matches the number you named, place it beneath your non-headquarters mission. Characteristics: manipulate / examine opponent's dilemma pile, place opponent's dilemmas under your mission, plays in your core. There are 16 entries for Dabo! (ST2E 8 R 28) at the Tradeplace (8 haves and 12 wants). Click here to see all trade list entries for this Rare card! Also see here for all trade lists with any card fom "To Boldly Go".